Administration officials and many Congressmen have touted that we are losing the “clean energy” race with China. One of their metrics is spending on “clean energy” investments. Another is on the amount of renewable capacity that has been built. Let’s see how the race is playing out. In 2011, the United States spent more on renewable energy than China, beating China’s “clean energy” investment for the first time since 2008. In 2011, the United States spent a total of $55.9 billion of government and private funds on “clean energy” projects, a 33 percent increase from 2010, compared to China’s $47.4 billion, 1 percent higher than in 2010. The higher U.S. “clean energy” investment was due to federal government support that included the Treasury Department’s 1603 cash grant program that expired at the end of December 2011, paying as much as 30 percent of the project’s development and construction cost, and the Production Tax Credit offering 2.2 cents a kilowatt-hour for wind production over the next ten years for wind power operational by the end of this year. The Federal Financing Bank completed 13 loans worth $10.1 billion for “clean energy” projects, according to a study of the industry’s top 20 lenders by Bloomberg New Energy Finance. [i] And, budget experts estimate that the production tax credit cost taxpayers about $1 billion a year. There is no guarantee these subsidies will pan out. Last year, three U.S. solar companies, including Solyndra, benefiting from U.S. government loans, went bankrupt, in part due to increasing competition from Chinese manufacturers. Besides these solar companies, Ener1, a battery maker that had received a $118 million government grant went bankrupt as well. Clean energy investment in Europe rose 3 percent to $100.2 billion, driven by solar installations in Germany and Italy and offshore wind in the North Sea. The largest renewable investment growth was in India, whose investment rose 52 percent to $10.3 billion. Brazil increased its renewable investment by 15 percent to $8.2 billion. In 2009, the financial crisis curbed lending and global renewable energy investment increased by only 1 percent. In 2010, however, global renewable energy investment increased 31 percent, reaching $247 billion. The slower growth in 2011 was in part due to European countries reducing their guaranteed rates for electricity produced from renewable technologies so that electricity prices would not continue to surge due to their renewable pricing policies. Chinese manufacturers are undercutting European and U.S. manufacturers in solar and wind technology markets. Supposedly, China is not just manufacturing wind turbines for export to U.S. and European markets, but it is also building the units to generate electricity in China. Let’s see how much those wind units are contributing to China’s electricity needs. 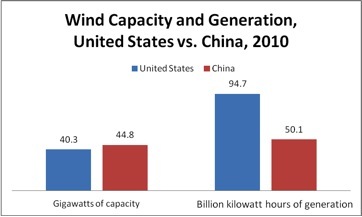 As of the end of 2010, China led the world in installed wind capacity, with the United States a fairly close second. By the end of 2010, China had installed 44,773 megawatts of wind turbines, compared to 40,267 megawatts installed in the United States. The irony is that with 11 percent more wind capacity than the United States had in 2010, China produced only about half the amount of electricity from wind that the United States produced. In 2010, China produced 50.1 billion kilowatt hours of wind powered electricity while the United States produced 94.65 billion kilowatt hours from wind energy. [iv] That lower amount of wind generated electricity for China is due to its transmission system not being able to handle the growth in wind capacity. Past statistics have shown that only about 30 percent of China’s wind units are connected to the grid. While China may have improved on this low number of wind units integrated with its electricity grid, the country clearly has still not solved the problem. Globally, renewable investment in 2011 was at its highest level; with investment in solar energy almost double that of wind. The United States led the world in renewable investments due to government incentives including the Treasury’s 1603 grant program that expired at the end of 2011, costing taxpayers over $10 billion. China’s renewable investment in 2011 was lower than that of the United States (by 15 percent) for the first time since 2008. While China’s renewable investments have been higher in the past than that of the United States and while China had more installed wind capacity at the end of 2010 than the United States, it is having trouble reaping their benefits. China generated about half the amount of electricity from wind in 2010 that the United States generated because it has not been able to fully integrate its wind units with its electricity grid. The “clean energy” race that many administration officials and Congressmen feel the United States is losing with China may just be a “tug of war”.